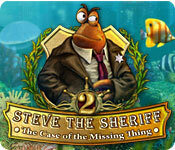 Rated 4 out of 5 by Zerotech from A good follow-up to the original "The Case of the Missing Thing" changes up the formula from the original "Steve the Sheriff". Steve has a new case to find a missing object. The music sets the mood with a few different slinky film-noir scores. The scene timer is gone and the "hint cigars" are now special collectible items. You need to collect all of them to unlock the bonus game. 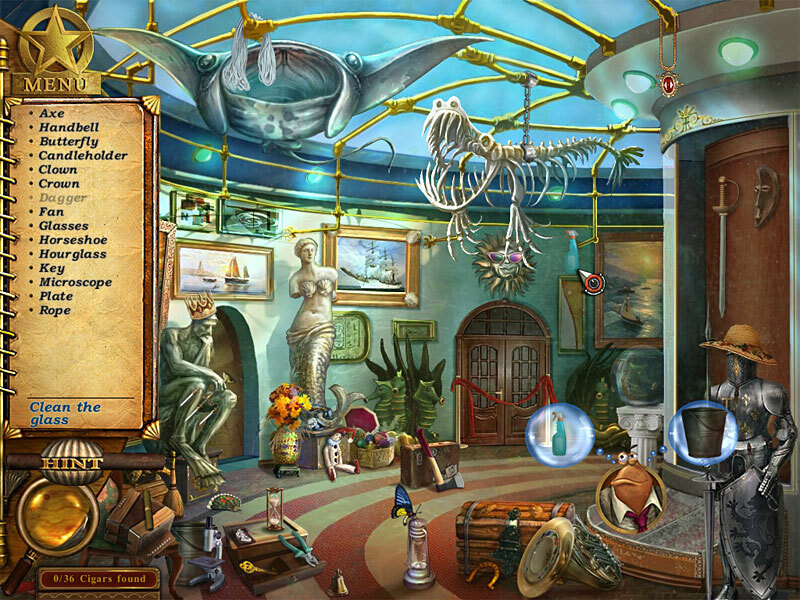 The hidden objects are, in general, a bit easier to find (I was able to complete more than half the HO scenes without needing a hint). Unfortunately for me, the only mini-game I needed to skip was the final one. I didn't realize it until I hit the "Skip" button and was at the end of the game! The game ends rather abruptly and alludes to yet another sequel (I'm not sure if it will ever be produced). If you don't collect all the cigars during the game, you're given a chance to go back and collect the ones you missed. Considering what the "bonus game" turns out to be, I'm not sure if you'll want to go to the trouble. If you hover your cursor over each collected cigar in the box, you'll be treated to "fun facts" (most are rather silly, all are in-jokes from the game). In conclusion; decent game, great music, a bit more fun to play than the first. At least worth catching with a sale price. Rated 4 out of 5 by Kizzi21 from A fun number Relaxing HO game. Loved the graphics. Good fun game for all ages. Rated 4 out of 5 by rosekaufmann from Such a cute adorable game for the young and young-at-hearts Nothing new in this game, but it can be enjoyed equally by adults and children because it’s just so darn cute. Storyline: When he’s not eating pie, Steve the lobster has to find out who pilfered a valuable painting from the town’s museum. 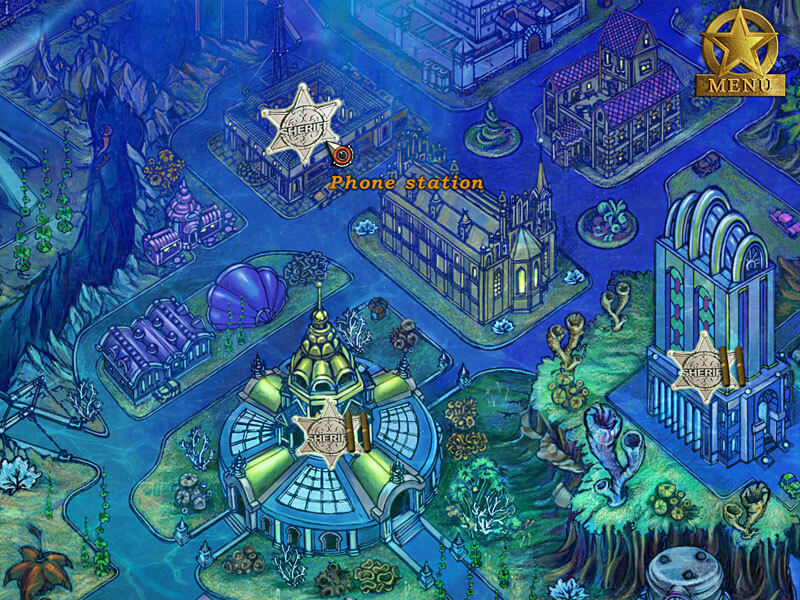 He has to search all over the wonderfully hand-drawn and colorful undersea town to find the culprit. Each location has a HOS, a cigar and a mini-game. Searching the HOS is delightful – everything is bright and large. The object list is alphabetical. Each HOS also has a bubbling area which requires special attention (i.e., special objects not in the list). Mini-games are varied, and are not very difficult. Dialogue is light and humorous. There are 36 environments to explore, with no backtracking. There’s a really cute bonus game available (chariot racing) once you’ve completed the game, provided you found all 36 cigars. [You can go back if you miss any.] You can play the bonus game as long as you want. Whether you’re a kid-at-heart or have the grandchildren to entertain, if you’re looking for a light-hearted fun game you all can enjoy, give this one a try. It’s been 3 years to get the sequel out. The ending did promise one! Don't recall how long it was because it was so fun I didn't keep track. Rated 4 out of 5 by voodoogueen from Sit Down With a Slice of Pie and Steve the Sheriff I have been playing this game for months. Literally. Every once in a while you need to kick back and goof off for a few minutes. This is the perfect game for that! I can't imagine trying to burn through this game. The jazzy music, the bad puns and the silly characters never failed to cheer me up, but a little goes a long way. But a week or so would go by and I would be back in Neptuneville, hunting for the Missing Thing! The hidden object scenes are actually pretty sophisticated. They are never repeated, contain little extras and always lead to a puzzle. Objects are fairly easy to locate with the exception of those last one or two items. Some items are small and the hint system recharges slowly so don't be lazy! Young or inexperienced players might actually find it a bit of a challenge. There is a politically incorrect cigar smoking theme in the game as well, so parents beware. The characters and dialogue are clever and silly as can be. So relax and have fun! Rated 4 out of 5 by amilahani from Relaxing HOG I assume this game is intended for kids. But nice to have a break from those intense, high resolution HOG for a while. The characters are cute, and the puzzles are fairly easy. Good game for beginner. Rated 4 out of 5 by purpleporpoise from Cute characaters, nice break from more intense HOGs.... Steve the Sheriff 2 is a nice change from the more challenging IHOGs I've been playing. I'm newb to hidden-object games and I'm finding some of them hard and a little difficult at times to get to the next level. So this one is a nice break, giving more relaxed play, while still offering me a little challenge here-and-there. The characters are cute and the graphics are great IMO. 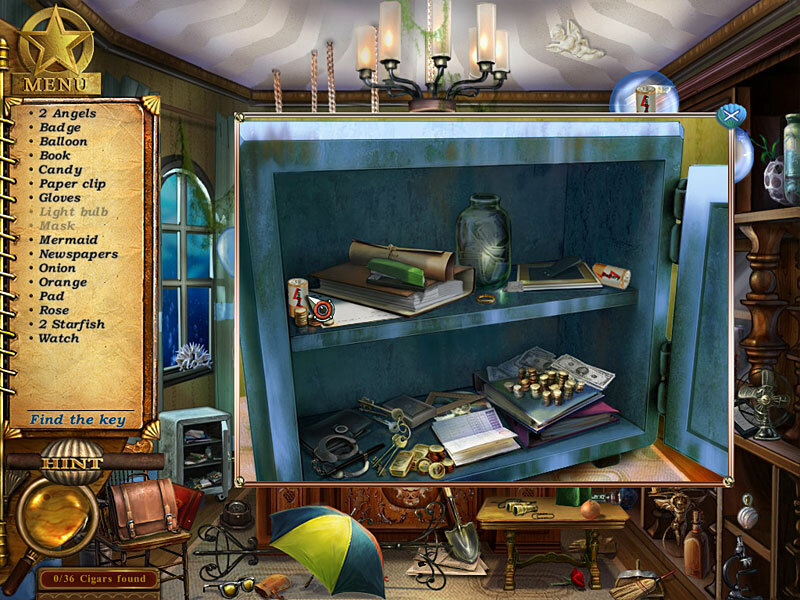 Hidden objects are fairly easy to find, but I've had to use hints on a few and I like the way you can hover over an object clue and the magnifying glass will show you the shape of what you're looking for, which has been very helpful a few times. I've read a few other reviews that say some of the dialogue bubbles between Steve and his family around the dinner table are irritating, but I just click through them fast, so it didn't bother me. The story line is a little silly, but he's a FISH, after all! If you're new to HOGs, this might be a good one to start out with before jumping on the larger, more challenging games and might be a good one for kids to play, but probably wouldn't be challenging enough or long enough play time for expert HOGgers. Rated 3 out of 5 by 2gooddogs from Good Clean Fun NO monsters, evil kidnappers, vampires etc. Just a cute relaxing HO game. This game is really more of a child's level of play and there's no shooting, killing or racing involved :) I just found it fun. This game is really just a HO game, but I found it entertaining. Steve's conversations at the dinner table, with his wife are amusing. ( He'd never solve a crime without her.) It's equally nice that there is no awful voice over, just some jazzy music in the background. Childish voice overs could have really made the game annoying. I would recommend this only if you don't want a challenging game. Use a free game token and share it with your kids. Rated 3 out of 5 by mspaws from Little slow for me This game is cute, but I need something a little more challenging. I got bored after about 20 minutes of play. Animations are cute. Good game to play with grandkids! Rated 2 out of 5 by woodspinner from Easy HOG Nicely drawn straight HOG game. Maybe I've been spoiled by all the later IHOG and adventure HOG games, but I quickly tired of this. Mini-games were way too easy as well. But this would probably a nice way to spend some time with a child so it isn't all bad. Just not for me. Rated 1 out of 5 by einiespal from Worst game ever This has got to be the worst game ever unless you are a three-year old kid. The story is dumb, the settings are dumb, game play is awful.